Gary Sinise knows well in advance how he's spending Memorial Day weekend. It's the same way he's celebrated the past nine holidays: co-hosting the National Memorial Day concert in Washington D.C.
"We usually have 200,000 people on the lawn of the Capitol. It's a tribute to all those who served and fallen in defense of our country," the 59-year-old actor said about Sunday's televised show on PBS. Events like this one are par for the course for Sinise, who founded the Gary Sinise Foundation for veterans in June 2011 and has been involved in veteran causes for even longer. Sinise, who played the Oscar-nominated role of Lt. Dan Taylor in "Forrest Gump," also has family members who served in the Vietnam War. With Memorial Day here, along with a recent spotlight placed on the U.S. Department of Veterans Aﬀairs, veteran care issues are coming to the forefront amid growing allegations of misconduct and treatment delays at Veterans Affairs hospitals. "What we do know is that there's a great need within the veteran community for additional services and additional support," Sinise told CBS News. "The VA system is obviously broken and has been for a long time. These current things happening in the VA that are coming to the surface right now -- that is a product of a very very deep problem within the VA. The VA has great doctors. They have great nurses. They have a lot of people who are dedicated. But it's a massive expenditure...Things are going to happen within a bureaucracy like that that are going to have negative effects. I think some of those things are surfacing now." In February, the VA announced that there were roughly 398,000 pending disability claims. From 2002-2012 more than 103,000 cases of veteran post-traumatic stress disorder were documented. During that same period, there were 1,715 battle injury amputations. The Gary Sinise Foundation and the USC School of Social Work recently highlighted some of those stats in a summit called "Closing the Gap: Meeting the Future Needs of America's Severely Wounded Heroes & Their Caregivers." Gary Sinise gives wounded veterans a "fighting chance"
"Will it change? I hope so," Sinise said. "I hope action will be taken to improve it and continue to improve it. I think a real constructive thing that could happen is a greater synergy between government and the private sector coming together to help each other out -- and in some cases that does happen." That's where the Gary Sinise Foundation comes in. Sinise says he's trying to do his part with his organization, which develops programs designed to entertain, educate, inspire, strengthen and build veteran, military and first-responder communities. After "CSI: NY" wrapped in February 2013, Sinise started working full time for the organization; he visits hospitals, performs concerts and helps build smart homes for wounded veterans. "This past year or more I've been just working with the foundation, building up our programs, raising the money to complete the commitments that we've made to various wounded service members that we're building houses for, helping modify houses or provide mobility -- whatever services they require," he said. "We're trying to fill as many needs as we can. The need is great, Sinise says, particularly because U.S. military members have served overseas for so many years -- many with multiple deployments. "There's a big residual effect after 13 years of war...There's thousands of service members that have been injured -- upwards of 50,000....There's traumatic brain injuries. There's post-traumatic stress issues...That's put a lot stress on families and caregivers for our wounded." With a focus on mobilizing communities all over the country, Sinise hopes to help close the gap in care for severely wounded veterans. "If every community and every neighborhood, every city and town made it a priority to seek out, identify and assist military families and veterans...who may have special needs because of their service -- if every community did that -- we would have a much-reduced problem within the veterans community." An estimated 22 veterans died from suicide in the year 2010, for example, according to the VA as veterans continue to struggle with their injuries and transitions into a non-military lifestyle. Sinise says community involvement is key to aiding military members. "It reduces the stress level, which could reduce post-traumatic stress that some of these service members face, and may potentially bring down the percentage of suicides we're seeing," he said. "There's a lot be done after such a long war...And we're still at war," said Sinise. "We're still losing service members in Afghanistan. And they're still getting blown up and they're still going into the hospitals and yet we rarely hear about it on the news because Afghanistan is not at the forefront of everybody's consciousness right now. It's been going on a long time, yet we still have thousands deployed who, when they come home, will have special needs." The non-profit world, according to Sinise, plays a critical role in taking care of U.S. veterans -- and his job is to raise awareness and educate others. "There's a disconnect between the American people and its military -- unless you have a personal relationship with someone who's served," Sinise said. "Quite a lot of people don't even know what a military person goes through or does or what their concerns are." The numbers appear to back that up. According to a 2012 Pew Research Center survey, 71 percent of Americans say they don't understand what veterans endure. Sinise hopes to change that one city, town and neighborhood at a time: "It's important to keep awareness up so we in the non-profit world can possibly meet some of these budgetary shortfalls or things that may be cutting back, assistance to the VA, which may be backlogged and problems with assistance being delayed. I think if we didn't have the successful non-profits out there that have popped up over the last 10-12 years in response to the needs of the military families, we would have a much greater catastrophe on our hands." 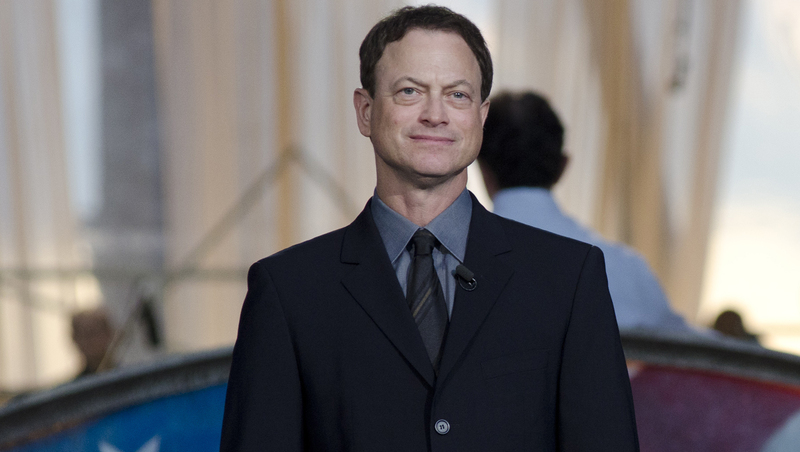 Meanwhile, Sinise already knows how he's spending the rest of 2014: The veteran actor plans to work full time with his foundation. Asked if he's looking to return to the acting arena, Sinise said he'll consider the idea, but not until next year. "I want to make sure my foundation is strong and that we can continue to solidify good partnerships...we're just trying to pitch in and do what we can."